To say that the economy in California is challenging these days is surely is an understatement. People are feeling the financial pinch throughout the state and the country, as well as across the entire income spectrum. Some folks might be tempted to cut costs by eliminating their auto insurance coverage while continuing to drive, risking the chance of penalties if they are caught. If you’re thinking of canceling your car insurance to save some money, that’s a great idea – as long as you’re thinking of simultaneously ceasing to drive, opting for public transit or a local carpool instead. Driving without insurance puts not only yourself but other drivers at risk, and it’s not something you should chance. While driving without insurance has less severe penalties than it does in other states, it’s still illegal unless you have a lot of money lying around to self-insure, and it is very much not worth the small amount you will save to go without insurance otherwise. Often, California is seen as a leader when it comes to new and severe penalties for any number of criminal or civil violations. Not so in the area of uninsured drivers, however. Compared to the nation as a whole, California’s penalties are rather tame. But that does not mean that you won’t feel the sting. In addition to a traditional insurance policy, California drivers have the option of obtaining a self-insurance certificate from the DMV, which usually requires providing evidence of a $35,000 cash deposit. Drivers (residents and those from out of state merely driving through California) that are caught operating a vehicle without valid insurance or a self-insurance certificate will be fined anywhere from $100 to $200 for a first offense and between $200 and $500 for a second offense. While $100 may not sound like much, with additional penalties and fees, that $100 penalty may end up costing you closer to $450. Additionally, your vehicle may be impounded and towed away, in which case you will not be able to get it back until you obtain insurance and pay all towing and storage fees. And as we all know, those vehicle storage fees can be substantial. An auto accident can be traumatic no matter how severe or whether you or anyone else, are injured. If you are involved in a crash in California, you must stop, pull off of the road and immediately call 911 to report the accident to police or the CHP. 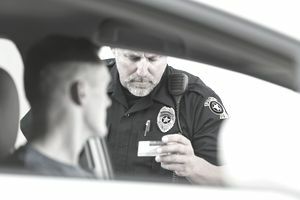 When the police arrive, you will be required to show them your driver’s license, vehicle registration card and proof of insurance. That’s the problem: what happens if you do not have valid auto insurance? In California, your license will be suspended, possibly for up to four years. Bear in mind that this can happen whether or not you are at fault for the accident. You may be able to get your license reinstated after one year if you obtain valid insurance, provide proof of it to the DMV and pay a re-issuance fee. You will also be required to get an SR-22 Proof of Financial Responsibility certificate and carry an additional high-cost SR-22 insurance policy on top of your regular one. Legal penalties are one thing: what about the cost of the accident itself? If you are the party at fault, then you are responsible for the cost of all resulting damage. And that means everything: damage to all vehicles involved and all medical costs for injuries to yourself, the other driver and any third-parties. How about damage to other public and private property such as street signs and lights, bus stop fixtures, storefronts, etc.? Yes, you are responsible for that damage, too. California requires all drivers to carry uninsured motorist coverage. Uninsured motorist coverage means that if the other driver in your accident has it, his insurance company will compensate him for his losses even if the accident is your fault. But don’t think for a moment that uninsured coverage means you will be off the hook. If you have assets, the other driver’s insurance company is likely to sue you to recover their costs. For example: suppose you get into an accident that is your fault resulting in tens of thousands of dollars in damage. If you have no vehicle insurance, but own a home with $100,000 in equity, the other party’s insurance company is likely to sue you to recover the thousands it paid out to their client. If you can’t pay up, you may lose your home. If you’re caught driving without insurance in California, it may be a good idea to contact an attorney for advice on how to proceed and avoid stiffer penalties. But the bottom line is, if you’re considering driving in California without valid insurance, don’t do it! The risk is too high and the penalties too severe. Times may be tough right now, but if you are looking to save money, driving without insurance is not the way to do it.